So,what's going to be with this hack. I guess I can let you know what has happened in the last couple of months. My brother and I have made huge progress on custom music for the beta. Jwibagi and I have finished mapping everything for the beta (up to Bill's house). Main story related scripts are just about done. When I finish up the last of the story related scripts and the last of the music, then I will spend a little while on non-essential scripts (extra things just for fun) and then the demo will be ready. 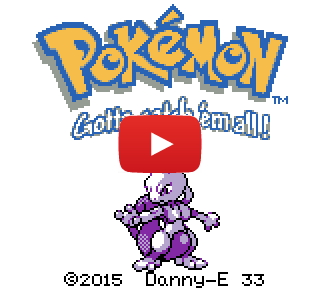 I like it very much, and I think especially the Gotta Catch 'em All theme in 8-bit is very awesome! I liked the bass line so much that I wanted to use it, too. Thanks. I know one improvement I want to make to it is getting the harmony right on "Teach Pokemon to understand the power that's inside." I don't have that part quite right yet. Yeah, I think you told me before, but I don't think I've told him. I'll have to pass it along! I had to move the Pokemon logo up one line and move the Prototype text down one line to squeeze in the new logo, but it looks pretty cool! Check out the first post for an updated title screen video! I <3 it. It looks really clean. wow man, this hack has continued to evolve !! I missed the pokemon hacking scene ^_^"
always inspiring to see you and your team create new things. Seems like a cool idea. I've gotta say, I'm a bit concerned with the fact that you lose whatever moves the other Pokémon knew. For example, say you were surfing. Shellder knew surf and Slowpoke was the only other mon in your team. You level up, gain Slowbro, suddenly you're stuck with nobody in your party that knows Surf and the HM is inside your PC. Not saying that would be a common occurence but it seems possible. Plus, having the Pokemon try to learn whatever the old Pokemon knew might be a cool way to get Pokemon with moves they couldn't normally know. Just a thought. I should do more with combining the stats/moves of the fused Pokemon.. Might happen at some point. Maybe you should make special item,or special place for this kind of evolution. It's been a while but I finally have another announcement! I redid the title screen yet again. This time I redid how the Pokémon silhouettes are handled. This update is a huge improvement for certain Pokémon like Dewgong, Goldeen and many others that have mostly white bodies. Also, I think this is the first time that all the new Gen II and Gen IV Pokémon are actually being exposed in game! Cool title screen! I didn't get 1 wrong! 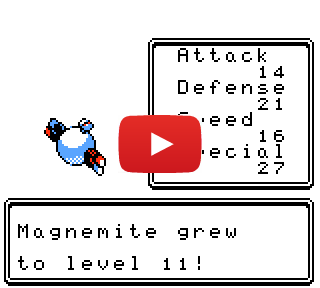 Could I use those munchlax sprites? 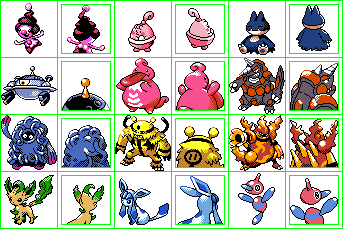 You're welcome to use my Munchlax back sprite, and I'm pretty sure Blue Emerald's Munchlax front sprite is fair game too. Just make sure the credit goes to him for that one, not me. Is there a download for this? I want your game on my flash cart!!! Hey! You songs are very good! How can i do that cool songs in pokered? Hey, thanks. It's not that difficult. You just have to set up the pokered disassembly and edit the song files in the audio/music/ folder. There is also a tool, pokemid, that converts basic midis into the text files that need to go into that folder. Oh wow, I am a bit late to the party. Really loving your updates to this hack ! I would like to pick your brain about the music edits mentioned above.